2017 has been all about training Trainers. By June of 2017 we had trained approximately 30 Trainers from 10 different countries. The trainers are now able to go back into their communities and train other professionals, teachers, therapists and parents in our Horse Boy and Movement Method courses. This meant that by half way through the year many new Horse Boy and Movement Method programs had sprung up in especially in the Netherlands. New regions and been opened for training including Hawaii, Colombia and South Africa. More trainings had been held as part of university programs in the UK and private and public school teacher in large school districts in both the UK had been trained. In addition by June 2017 we received a grant from the Rainwater Foundation to adapt the full math and science middle school curriculum kinetically for use in the classroom with pilot projects set to begin in their delivery in 2018. In 2016 we really expanded the understanding of the brain science behind what we do and began collaborating with many more universities including University of California San Diego, and the Open University of the Netherlands, and others already listed throughout this website. This resulted in clearer view of how and why our Methods first stop the cell danger response in the brain, then create oxytocin to calm the nervous system and open the child to communication, and finally activate the cerebellum, Purkinje cells, vestibular system, pre-frontal cortex and the brain's own heightened IQ system (Brain Derived Neurotrophic Factor). 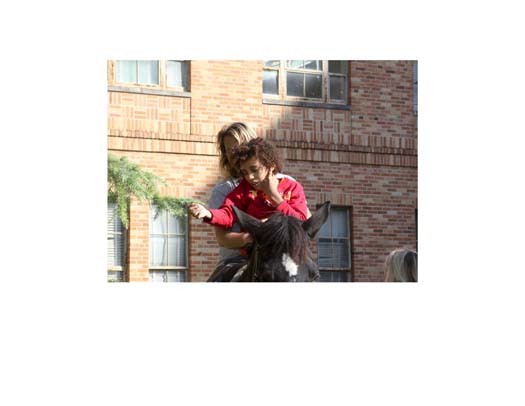 We reorganized Horse Boy Method and Movement Method in such a way that our families now learn the brain science and are trained in how to keep this neuro-plasticity going at home, achieving much greater cognitive results than in most therapies. We created, filmed and uploaded 139 lesson plans and modules that any family can use anywhere, anytime from the most basic communication to pre-college level math and science. We did this in close collaboration with Dr. Alfred Ziegler from the department of physics at the University of Osnabrueck. These modules are available through our training division and are currently re-adapted again for use in schools. Responding to the problem with behavioral therapies and the harm they can cause children, we reached out to a large ABA provider in California to help create a more compassion-based behavioral approach that could be funded through insurance. We set up a pilot program through our Horse Boy and Movement Method Practitioners at Square Peg Foundation in Half Moon Bay, CA and Steven Forth BCBA (Board Certified Behavioral Analyst), replacing certain key concepts within behaviorism that are known to cause the cell danger response in children with more effective approaches sanctioned by adult autists. These include replacing the concept of compliance with cooperation, replacing the concept of socially appropriate behaviors with kinetically learned life and social skills, replacing the withdrawal of attention with intense comforting when a child is distressed and replacing quiet rooms (aka punishment chambers) with delightful outdoor spaces where the child suffering a meltdown can re-calibrate their nervous system. The results have exceeded our expectations: both allowing our Practitioners & Mentors a way of billing for their services through insurance which makes our services more sustainable; and potentially expanding our reach into the hundreds of thousands of families. We will be expanding our CBA model in 2017 and 2018 to more Horse Boy Locations. What this space. In order to reach our mission goal of 1,000,000 families, we need to train 400 trainers of our methods (not just Practitioners and Mentors) between now and 2021. These trainers will then go out and train other groups of Mentors and Practitioners that in their turn will then work with families around the world. To this end we created Train the Trainer Courses for Horse Boy Method 1 and 2 and Movement Method 1 and 2 through our training division. The first Train the Trainer Courses are set up for 2017. In addition we trained more and more people in the approximately 20 countries we are now active in. New on the map came Aruba, Trinidad & Tobago, we also trained people from Dubai, Australia and South Africa. The most important part of Horse Boy Method. The environment meets the child's sensory needs, triggers no sensory discomfort, and allows us to say YES to anything the child wants to do: play equipment, small animals, and activities for the siblings.